Last week I put up a short guide and review of CMus, a powerful audio player using the ncurses interface. Today I'll continue with an overview with screenshots of MOC, and hopefully in a few days I'll also review mp3blaster. 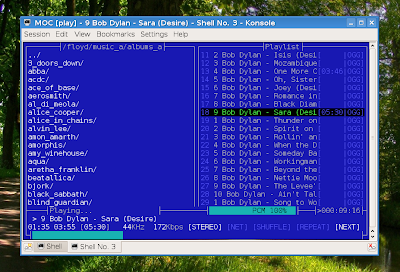 Based on ncurses, MOC (music on console) is a popular, text-based audio player which can play various audio formats, including Ogg Vorbis, FLAC, MP3, MP4, WMA and WAV. The release I'm going to talk about in this article is 2.5.0-alpha3, as it comes with Debian Lenny. 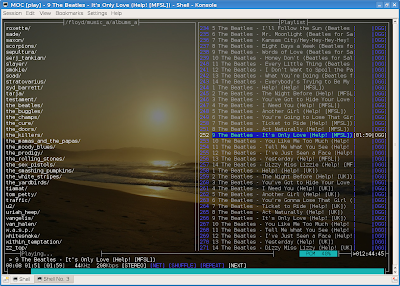 MOC does not seem to include Last.fm song submission by default, but there is a script on the official website called lastfm-mocp, here (direct download link), which uses the Last.fm submission daemon (package lastfmsubmitd in Debian). The configuration file for MOC is ~/.moc/config, but it is not needed by default. It also supports configurable keybindings. I liked that MOC can also run as a 'server' by detaching the player using q. 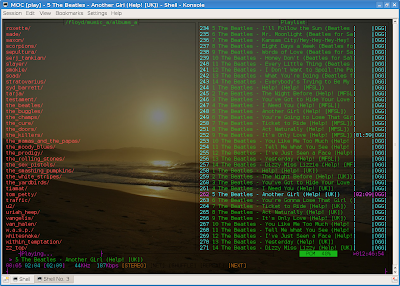 Overall, it is a pretty nice audio player for the shell, it's lightweight and provides a very good and easy to use alternative to other players like CMus or mp3blaster. i've been using this for a few years, neat program! I like moc because it caches streams which means that even with our lousy network @ work I have no interruption to the music. I use mpd/ncmpcpp exculsively... it has lots of fancy features but is still fast and lightweight. I have used MOC for ages. 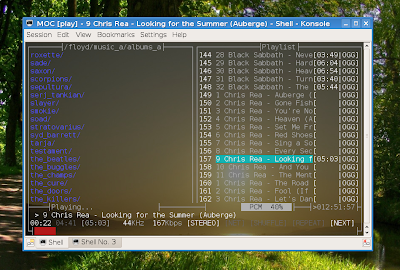 I too find the server feature to be very useful, just open a 'run' window anywhere and type in what you want to do (skip track, adjust volume, stop...) I have also installed the imocp.pl irssi plugin ( http://tinyurl.com/imocp-pl ) which will allow you to display what you are listening to in the current channel, as well as controlling it. i discovered it thru crunchbang. absolutely love it. no gui music player, no mpd.